The Prince of Persia makes his way home to Babylon, bearing with him Kaileena, the enigmatic Empress of Time, and unspeakable scars from the Island of Time. But instead of the peace he longs for, he finds his kingdom ravaged by war and Kaileena the target of a brutal plot. When she is kidnapped, the Prince tracks her to the Palace – only to see her murdered by a powerful enemy. Her death unleashes the Sands of Time, which strike the Prince and threaten to destroy everything he holds dear. Cast to the streets, hunted as a fugitive, the Prince soon discovers that the Sands have tainted him, too. They have given rise to a deadly Dark Prince, whose spirit gradually possesses him. Choose your way to kill: Master the expanded Free-Form Fighting system to destroy enemies in your own style, strangle enemies from afar with the deadly Daggertail or use the art of stealth to inflict surprise decapitations – the choice is yours. Battle freely through Babylon: Dominate enemies on the perilous rooftops, dodge through chaotic streets and ambush pursuers in dark underground passageways. Manipulate time to surprise enemies: Execute powerful attacks against entire armies by slowing down or rewinding time, or surprise them by using some Sands of Time powers unique to Two Thrones. © 2005 Ubisoft Entertainment. All Rights Reserved. 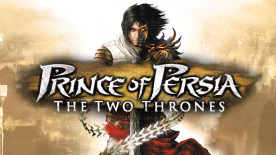 Based on Prince of Persia® created by Jordan Mechner. Ubisoft and the Ubisoft logo are trademarks of Ubisoft Entertainment in the U.S. and/or other countries. Prince of Persia, is a trademark of Jordan Mechner in the US and/or other countries used under license by Ubisoft Entertainment. Software platform logo (TM and ©) EMA 2006.